What's happening in global politics, and is there a thread that ties it all together? As if overnight, many Democrats revolted and passionately backed a socialist named Bernie Sanders; the United Kingdom voted to leave the European Union, in a stunning rebuke; the vituperative billionaire Donald Trump became the presidential nominee of the Republican Party; and a slew of rebellious parties continued to win election after election in countries like Switzerland, Norway, Italy, Austria, and Greece. 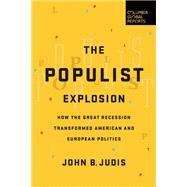 John B. Judis, one of America's most respected political analysts, tells us why we need to understand the populist movement that began in the United States in the 1890s and whose politics have recurred on both sides of the Atlantic ever since. The Populist Explosion is essential reading for anyone hoping to grasp a global political system that is only just beginning what will be a long-running and highly consequential readjustment. John B. Judis was a senior editor of The New Republic and recently a senior writer for The National Journal. He is the author of six books, including Genesis: Truman, American Jews, and the Origin of the Arab-Israeli Conflict (Farrar, Straus & Giroux, 2014), The Folly of Empire: What George W. Bush Could Learn from Theodore Roosevelt and Woodrow Wilson (Scribner, 2004), The Emerging Democratic Majority with Ruy Teixeira (Scribner, 2002), and The Paradox of American Democracy: Elites, Special Interests, and Betrayal of Public Trust (Pantheon, 2000). He has written for numerous publications, including The New York Times Magazine, Mother Jones, and The Washington Post. Born in Chicago, he received his B.A. and M.A. degrees in Philosophy from the University of California Berkeley. He lives in Silver Spring, MD.